Time to table: About an hour total including chopping and prep – could have been sped up if I went faster though. Servings: 5 adults I think. We have leftovers after feeding our family of 5. Modifications: I used the basic idea of the curry – chop and saute an onion in oil, add chicken, add curry paste and cook for awhile. Then instead of potatoes, I used broccoli. I also made mine a bit soupier than the recipe and added an additional can of chicken broth (just water with better than bouillion mixed in). Then realized we had some spinach that didn’t have a use planned for it, so threw that in there at the endtoo. Kids: Meh, they ate it. It wasn’t met with outright disgust so I’ll call that a win. I let Annie have it without rice. They all thought it was ‘spicy’ aka contained flavor. This prompted a very long discussion with Annie about the difference between spicy heat and flavor. Notes: We’ve had this curry paste in the freezer for a super long time, need to use it up! This is always an easy, healthy meal and I’m not sure why we don’t make it more often. 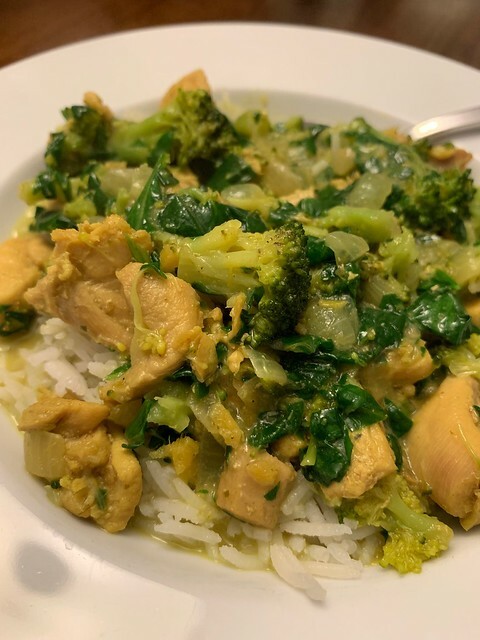 This entry was posted in broccoli, chicken, coconut milk, onion, rice. Bookmark the permalink.